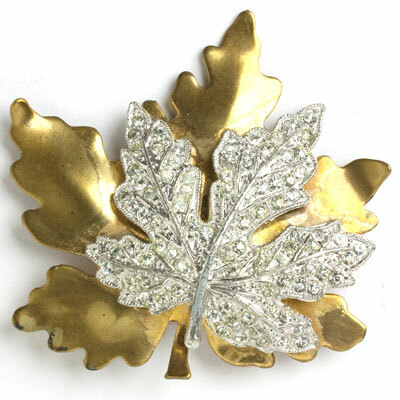 This brooch by McClelland Barclay features a small silver-tone diamanté-encrusted maple leaf laid on top of a larger gold-tone one. The pin closes with a roll-over safety clasp. With two colors of metal, this graceful piece can be worn with anything. The bright areas on the bottom leaf are camera reflections. The two small areas of darkening are not noticeable when worn. 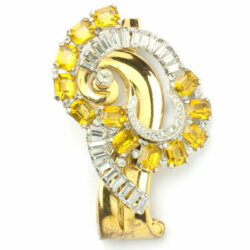 According to Brunialti, Gioia Mori's biography of Tamara de Lempicka includes a picture of the well-known Art Deco portraitist wearing a brooch like this one. Need a better endorsement? 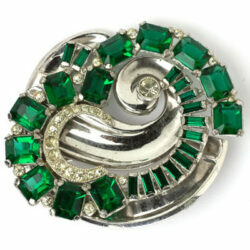 This vintage emerald brooch, designed by McClelland Barclay, has two layers. On the bottom is a curved, rhodium-plated base with a pin and roll-over safety clasp. 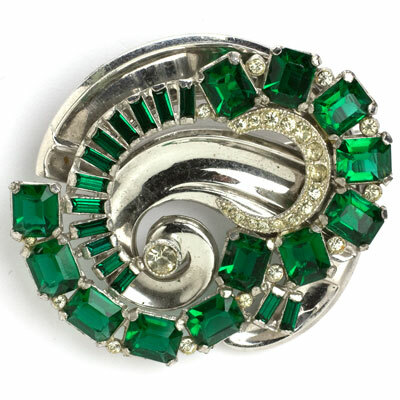 The top layer has faceted, emerald-cut emerald-glass stones, emerald baguettes, and diamanté accents, all set in a spiraling rhodium-plated frame. 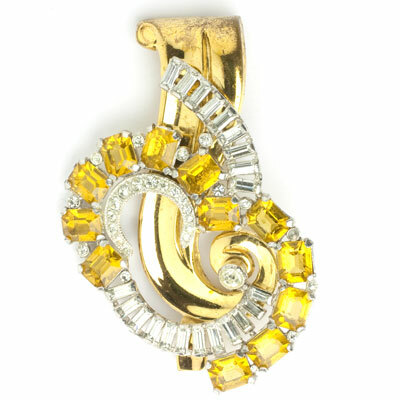 As with all of this designer’s creations, this 1940s piece is well-constructed with a hefty weight. 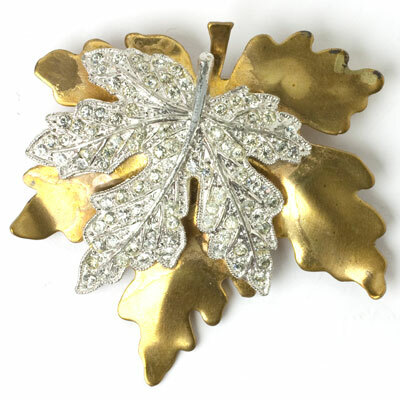 I’ve shown this jewel positioned in different ways, so you can choose which you prefer. Note that the Barclay’s name rather than the maker’s is marked on the brooch.